Huawei will unveil world's first 5G foldable smartphone next month | What Hi-Fi? Huawei will reveal the world's first 5G smartphone with a foldable display at Mobile World Congress next month. 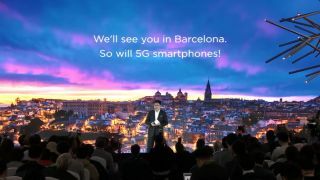 At the end of Huawei Mobile's launch 5G event in Beijing, CEO of the company's Consumer Business Group Richard Yu told attendees: "We look forward to seeing you in Barcelona in February, where we will launch the world's first 5G smartphones with foldable screen," according to a translation by Android Police. Curiously, the plural of "smartphones" points to there being more than one handset - unless of course it was purely a translation error, which seems likely. We've known for the best part of a year that Huawei has been working on a 5G phone, but only a few months ago Yu said the device wasn't ready. The reveal at MWC could be of a prototype, then. From looking at the accompanying presentation slide at the event, it looks as though the handset will also use Huawei's new Balong 5000 5G chip. In other 5G news, LG looks set to release its first 5G smartphone in the US in the first half of this year through US carrier Sprint.